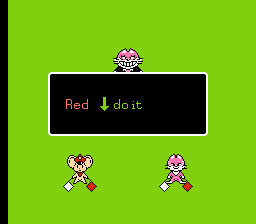 Mappy Kids is an action platformer for the Nintendo Entertainment System. 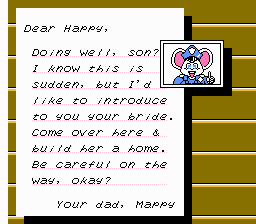 Mappy made an arranged marriage for his son Happy. However, Happy must make a lot of fortune first before reaching his home so that he could marry his bride-to-be. The game features standard platforming and has mini games in between stages. However, the game does not feature the original trampoline gameplay of the namesake title. 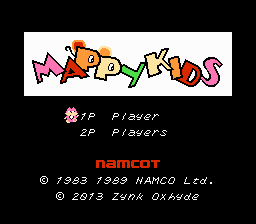 This is an English translation of Mappy Kids for the NES! Don’t expect any Mappy trampoline game mechanics though. The game is an action platformer. The objective is to collect treasures from chests & breakable blocks. 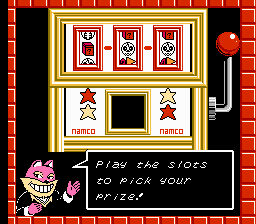 You can also earn cash from bonus games after each stage. 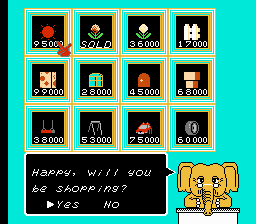 However, the main objective is to buy items from the shop to buy your bride a house, a car, a garden… and even the sun! Really. In one player mode, you need to buy most of the items. But in two player mode, you need to at least earn more money than your friend.